The Old Yarmouth Inn offers classic cuisine - the best in fresh local fish, shellfish, steaks and pasta. 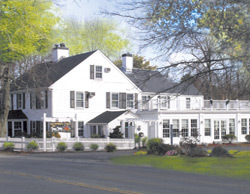 Whether you are looking for a casual meal in our cozy wood paneled tavern or a view of our gardens from the dining room, once you have experienced The Old Yarmouth Inn’s delightful menu, warm, friendly staff and awesome wine selection, you will know why we’ve become one of the Cape’s most popular dining destinations on Cape Cod. We place an emphasis on offering the freshest and most seasonally appropriate items and as a result our menu changes seasonally. We look forward to seeing you soon! Reservations always accepted. but at the Old Yarmouth Inn the price of our Award Winning Sunday Brunch is going DOWN! for the month of August enjoy our Sunday Brunch Buffet for only $15.95...Stimulate your taste-buds! Now through Columbus Day Weekend!